This is one of Jen’s free recipes on Jen’s Fit Playground and is really good! Make sure you have cooked brown rice ahead of time and I know buying canned roast beef sounds weird but you’ll rinse all the gravy stuff off of it. Of if you have left over beef that you can shred, you could use that too. Or chicken! I didn’t have great northern beans so I just used white kidney beans and black beans. My kids ate this like I had not fed them in two days. 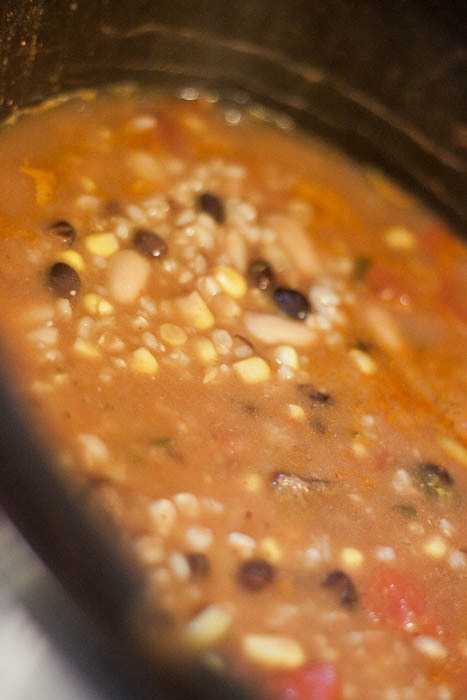 Thoroughly rinse and drain beef, corn, and beans. Break beef up with a fork and add to the crockpot. Add all remaining ingredients and stir. Add salt and pepper to taste. Cover and cook on high for 3-4 hours or low for up to 6 hours. Stir thoroughly before serving to ensure refried beans have mixed in. *Cut out some of the sodium by cooking your own white beans and using fresh corn. How do you know it’s beef in that can?? Plan ahead, crock pot your own…. just sayin’.